Jim Kenney, center, is sworn in as Philadelphia's 99th mayor, Monday, January 4, 2016 at the Academy of Music. Mayor Jim Kenney was sworn in as Philadelphia's 99th mayor on Monday morning during a ceremony at the Academy of Music. Kenney, 57, a lifelong South Philly resident and longtime city councilman, won the November election to succeed Mayor Michael Nutter, who held the office for the past eight years. The new mayor completed the oath at 10:55 a.m. with his children Brendan and Nora at his side. In his inaugural speech, Kenney thanked his family, especially his parents, who, he said, along with the Jesuit priests at St. Joe's Prep, were the examples that led him to a career as a public servant. "You can never truly be happy unless you're in service to others," Kenney said. Sworn in by newly-elected state Supreme Court judge Kevin Dougherty, Kenney joked that he and Dougherty, both South Philly born and raised, had done pretty well for themselves. "We did pretty good, Kevin, don't you think?" said Kenney. "God bless America." 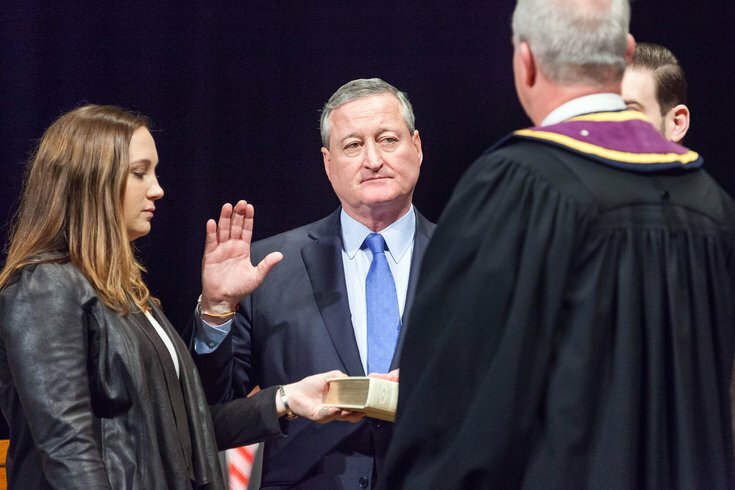 In a short inauguration speech, Kenney discussed some of his plans for his coming tenure and his hopes to improve the city. He especially discussed his community schools plan – a model he's working to develop after a recent trip to Cincinnati – that Kenney said will help bring city services to schools throughout the city and help improve educational opportunities that allow students to be "educated where they live." "Our children should not have to get up before dawn and take three buses just to get a good education," said Kenney. Kenney also discussed diversity goals, such as working with police and the community, because "black lives do matter," and said that he hopes to help encourage investment in small local businesses, grow commercial corridors and build the city's living wage economy. An appreciative Kenney thanked all in attendance and said that he hopes to work in partnership with City Council. "To all those Philadelphians, and to all the rest, who entrusted me with this great responsibility, thank you. Thank you from the bottom of my heart," said the mayor. The inauguration began at 10 a.m. with a blessing by Archbishop Charles Chaput of the Archdiocese of Philadelphia. It also included newly-elected and re-elected Council members taking their oaths of office, and then the Council voting unanimously to re-elect Darrell L. Clarke as council president. 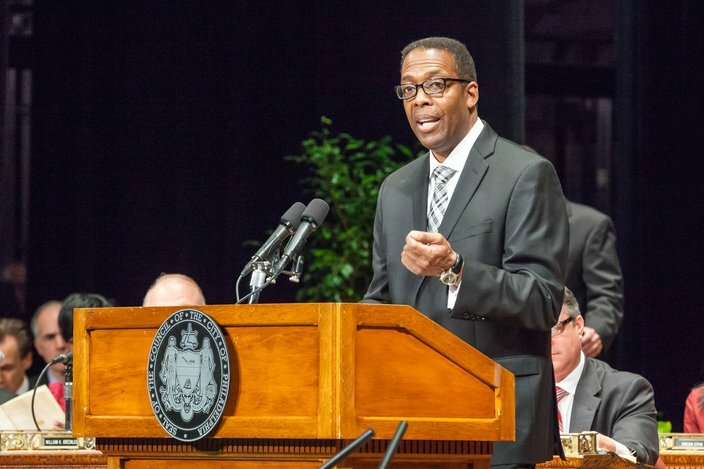 Darrell Clarke was sworn in Monday to serve his second term as President of City Council. Clarke, too, talked about community schools and the need to grow the city's economy in the coming years. And Clarke told the crowd that he has pledged to working with higher education communities in the region to ensure that Philadelphia public school students are getting the best education the city could possibly provide by not teaching to the test, and instead "teaching to the job opportunity." "All children deserve a quality education just as our own," said Clarke. Without going into too much detail, Clarke said that in the coming year there will be announcements focused on reforms to neighborhood schools, as part of the new community schools plan, as well as the criminal justice system. "I look forward to the next four years, because it's going to be a blast," said Clarke. Among the elected officials in attendance was Pennsylvania Gov. Tom Wolf, who received a standing ovation from those seated on stage when Clarke introduced him. "We still love you in the city of Philadelphia," Clarke said, noting that feelings may be different in the rest of the state. "But we love you here." In a recent interview with PhillyVoice, Kenney talked about growing up in South Philly, his strong Irish Catholic roots and his family. Most recently, Kenney spoke out about events at the Mummers Parade on New Year's Day, after many expressed concerns about homophobic slurs and offensive skits that were on display.